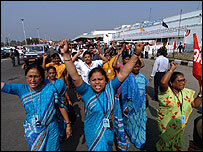 Indian airport workers have struck for a second day over job fears, causing disruption but no widespread delays. Workers picketed Delhi and Mumbai airports amid tight security. Flights operated near to normal, officials say. Flights also partially resumed at Calcutta airport, worst hit by the strike, a day after being suspended. 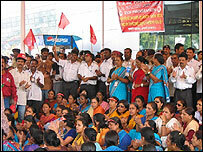 The strike follows plans to privatise Delhi and Mumbai (Bombay) airports. The Delhi High Court has banned strikers from coming within 500m of any airport. As part of the deal approved by cabinet on Wednesday, India's two largest airports will be leased to construction firms GMR and GVK, and their foreign partners, who won the modernisation bids. On Thursday, one of the unsuccessful bidders, Reliance Airport Developer, filed a petition in the Delhi High Court challenging the award of the contracts. A spokesman for Reliance said awarding the contract for Delhi airport to GMR had been "illegal and arbitrary". Workers say privatisation will lead to job cuts and hardship for thousands of staff. "What guarantee is there that I would be given a job? These private companies have already said they will not keep 40% of us," one striker told Reuters news agency. Despite the action, air services ran almost normally on Thursday with planes taking off and landing at all of India's airports, the civil aviation ministry said. Officials at Calcutta airport, however, said only 30% of planes departed on Thursday morning. Flights had been temporarily suspended on Wednesday. "My officers are doing their best. But unless the other employees return to work, it will be very difficult to restore normal services," airport chief DK Monga told the BBC. Businessmen complained that perishable cargo was rotting on the tarmac as there was nobody to move it. At Delhi and Mumbai airports there were slight delays and inconvenience to passengers but no cancellations. Riot police are guarding the airports. "Cleanliness at the airport has been affected as the ground staff is on strike but we will take some action on this today." Trade unions and striking workers say they have no plans to return to work. "We're going to intensify our agitation until the government relents," Nitin Jadhav, general secretary of the Airports Authority Employees Union in Mumbai, told Reuters. "It is the question of the lives of thousands of airport employees and their families." The government says it hopes the situation will return to normal soon. It has sought to allay workers' fears, saying all employees will be retained for the first three years. Delhi and Mumbai airports handle almost 65% of India's international traffic of 19m passengers a year.